TickTA allows you and your business to save time, money and increase productivity by allowing you to schedule and record your team's working hours efficiently and hassle free. Up to 5 employees is free. No commitment. Hardware optional. Start your free 7 day trial and access TickTA now! Adaptable for remote workers, either on the road or at home. Manage your teams shifts hassle free. Handles complex rules and pay calculations with ease (e.g rates of pay, shifts and public holidays). Use our communal app to record your employees, visitors & contractors attendance. Track when they arrive & leave all your work sites. Configure alerts so you know immediately if resource levels are low. TickTA prohibits people submitting false times or attendance for days they were not present. Reduce the amount of time it takes to process pay and put that time to better use. Eliminate human error from poorly filled in timesheets or illegible handwriting. Gain detailed insight into actual labour costs. Standard suite of reports include on-site workers, late arrivals / early starters, remote workers, hours averages, time sheets, rota / work calendar, absence / holidays and many more... Reports can be viewed online or downloaded in Word, Excel and PDF format. Custom reports are available on request. Ensure your team are on site for the appropriate amount of time and set them tasks. Manage multiple locations centrally in one tool. Eliminate the need for paper based time sheets, save paper and become greener. Add time and attendance to your business without having to install and maintain expensive hardware. Export your employee hours straight out of TickTA and into your Payroll system hassle free. TickTA also allows you to define multiple overtime rates using the flexible shift setup wizard. TickTA has built-in functionality to allow visitors to register their attendance using the TickTA Clocking Apps (available for Android, iOS and Windows) which improves the accuracy of the emergency evacuation report. TickTA allows you to schedule who's working in advance and also specify overtime and hourly rates. TickTA has built in holiday approval processes, so you can always ensure you have the right level of resource at all times. TickTA is hosted in the cloud which means that you don't need to worry about the maintenance of your data on-site. 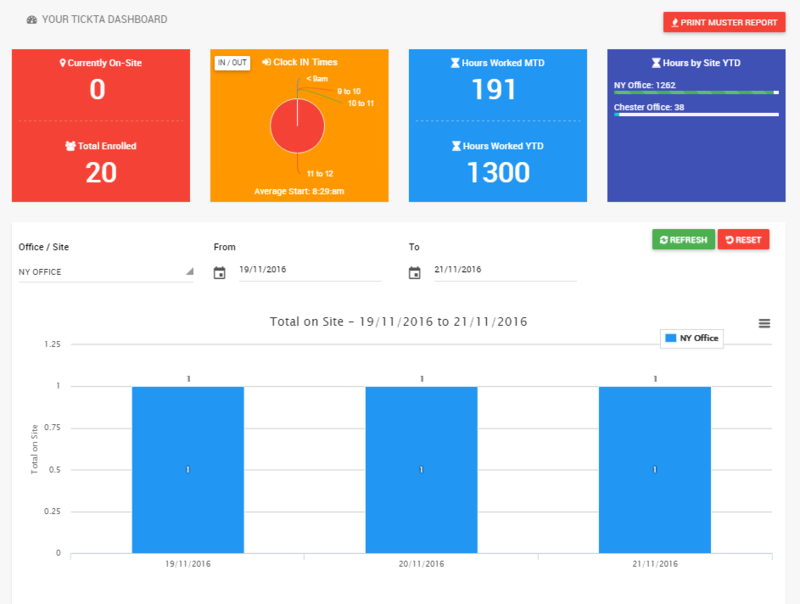 Manage all of your work sites, employees and attendance from anywhere using TickTA admin portal. The portal is available 24/7, all you need is Internet access! As soon as your employees register their attendance, the apps automatically update the online portal providing you with real-time statistics for all of your work sites and teams. Enrol your people once and they can clock in at any of your work sites without having to enrol them again. There is no limit to the number of work sites you add nor the number of clocking terminals you add at each work site. There is also no limit to the number of admin logins you can add. So your time and attendance setup can be as simple or as complex as you require, and whomever needs to access it can do so from anywhere at any time. Turn any PC, tablet or mobile device into a clocking station with our free apps availble for Windows, Android & iOS. Simply set up the access point in the admin portal and then download our free app on to your device. 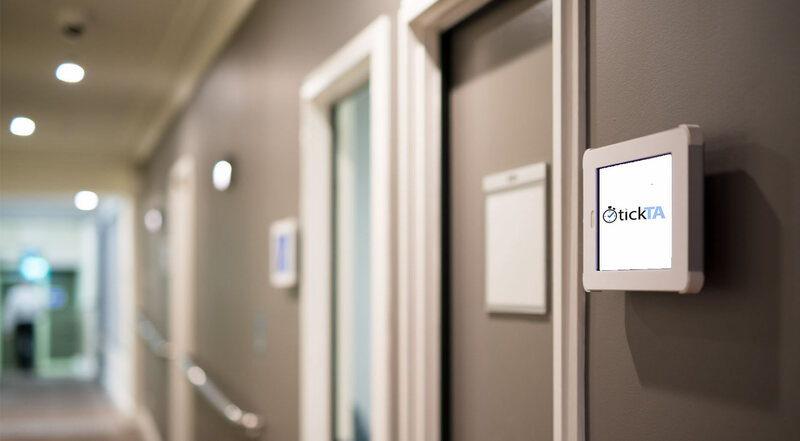 The app allows your team to register their attendance with a unique pin code, access card, finger print or our latest addition - face detection! Once you are up and running, check out our selection of wall and desk mounts. 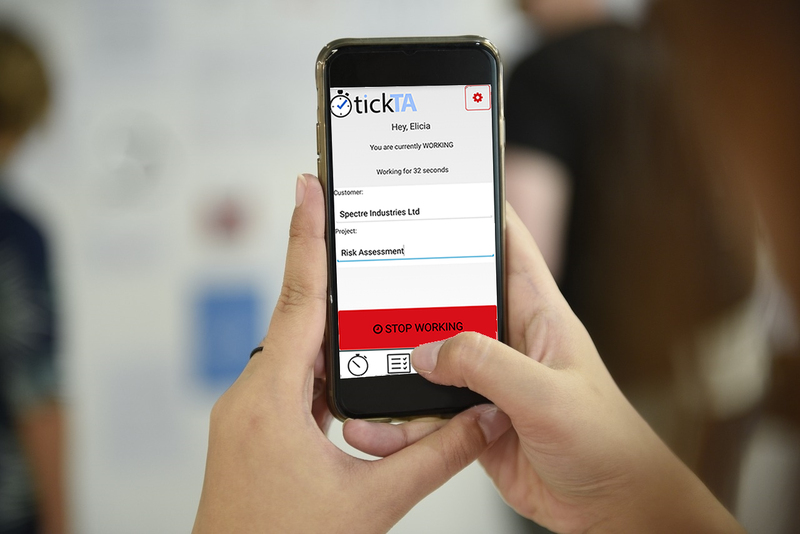 The TickTA worker app enables your internal team and external workers (for example contractors, workers out on site, at home or travelling) to register when they are working, what on and where all in a couple of taps on their smart phone. The app optionally allows your team to request absence (such as training or vacation time) and view their upcoming work schedule / shift rota - all of which can be set up and maintained in the admin portal. Suitable for both remote workers and internal staff members. In addition to registering your teams status, the app allows your team to tag time against specific resources, such as a customer or a project, all of which can analysed and linked to other systems (such as payroll, billing etc..). When you first start your trial you will notice some employees are already set up along with some test data, this is so you can quickly evaluate how powerful TickTA is and gauge how easy it is to use. Once you understand exactly how TickTA hangs together (which won't take long! ), the test data will be removed and the next step is setting up your work sites, shift groups, workers and access points. Configuring TickTA is straight forward, however our support team can assist you if you have any queries or would like to import your data from another system. Please contact us here or use the remote chat tool in the bottom-right corner. When you are happy with the configuration, set the access points live and you can send out app instructions to your remote workers. What are you waiting for? Start your trial now! To start your 7 day trial, all we need is your email address. No credit card required. Copyright © Top Speed Support Ltd 2018. All Rights Reserved.